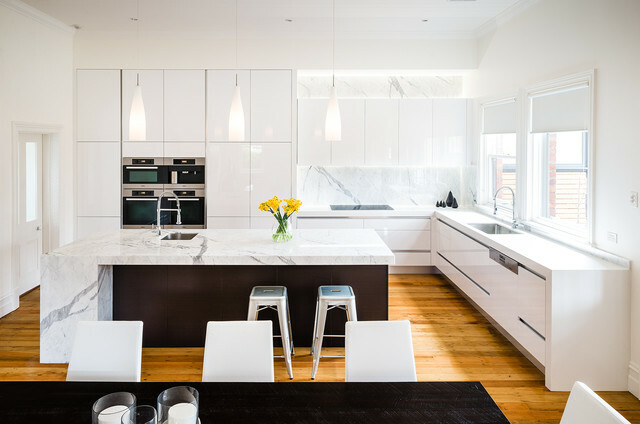 Crisp White High Gloss Kitchen with Veneer Feature island and Marble Bench Tops. Client spared no expense using marble for Splash back and feature wall. Where do the cabinets come from? What are they called? 72"x 40" is my guess. Where is the seam in this island? - Where is the seam in this island? Is it true Carrera or is it quartz? This is True Calcutta Marble 3 metres long. There is no Seam. Especially chosen for this project. Love this! What are the cabinets made out of? Most likely MDF, however, they are finished in lacquer. Lighting manufacturer? - Nice kitchen design! Love the choices. Could you share the manufacturer of the pendant lights? What s the name of the quartz? Brand? I love it. - I am looking for a countertop to go with those white glossy cabinets. Kitchen lighting - Where are the hanging light fixtures from? Which white quartz countertop was used? - I love the mix of the white quartz countertop in the back with the marble backsplash! Could you please tell me which white countertop was used? Thanks! Blinds - where are the roller shades from? Hi - Please share the source/maker of the the Pendant lights...? Love this Counter Top, Who makes it, and what is it called?